Looks positively wonderful. I'm glad you won. But if he had won, would he have taken over your blog? By the way, I love those floral napkins - so pretty! That sound bliss; both the food and having a foodie as a husband. Mine, lovely though he is, is a meat and 2 veg type. I love coming to your blog...you always have such great photos...and they make me so hungry! Love these flavors!! Of course you were going to win :) I've had a satay recipe in my cookbinder for a few years now and just can't get excited about it, but I can TOTALLY get excited about this!! I would make extra marinade to use as sauce!! 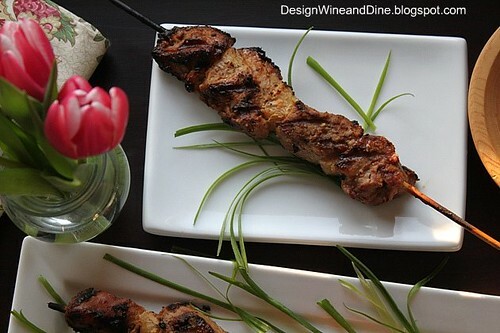 Most delicious satay! I can already taste it reading the recipe! Your fabulous photos makes this dish even more irresistible and appetizing. Most beautiful composition, I have to say! I have been getting lots of ideas from your blog lately! Thanks so much. 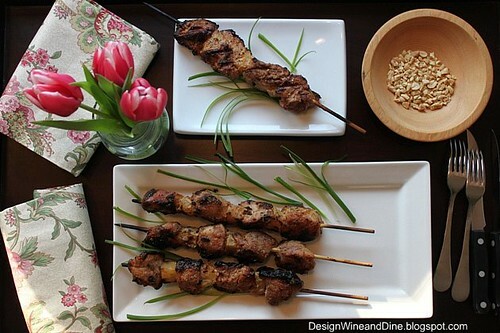 Beautiful satay. I am glad you won. These competitions are great because they make life more excited plus they are great stimuli for us to become even better lol. I love satay (just made it last night actually!!) yours looks delicious!!! I am smiling!!! I can see why you won-love it. I really enjoy satays. I love every thing about this post - the pictures, the story, the fact that you won and MOST of all that your hubby challenged you to a cooking throw down. Mine only comes into the kitchen to ask what's for dinner! ha, what a fun challenge - looks like you succeeded! I love that you guys have so much fun together! Can I come over & eat with you??? This looks positively amazing! I love that you & your hubby had a throw down, no cookbooks allowed :) What FUN! Congrats on the win!